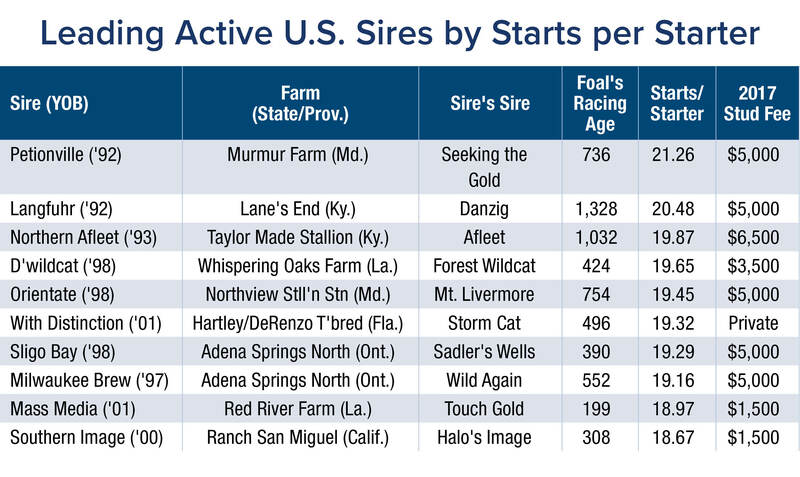 Sources of stamina among North American stallions seems to be getting leaner as judged by the recent release of the Grayson-Jockey Club Research Foundation's annual report of sire durability and soundness (see near pg. 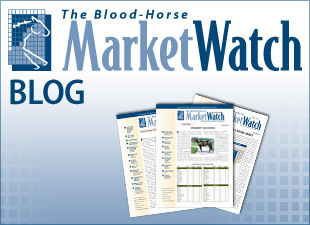 66 in the Feb. 11 issue of BloodHorse). Among the leading 30 stallions by starts per starter, 13 sires have died, two are pensioned, and three have been relocated to either Argentina or Australia. The stallions included in the durability study are the top 200 sires by progeny earnings for the 2016 calendar year in order to assure relevance to the commercial breeding and sales market. The study's key statistics of starts per starter and percentage of starters from foals of racing age, however, are all lifetime statistics. Combing through the study, one stallion consistently ranked among top sires by various statistics published. Taylor Made Stallions' veteran Northern Afleet ranked among the top 10 by starts per starter, the top 20 by percentage of starters from foals of racing age, the top 10 by number of 2016 graded stakes winners 4 years old and up, and was in the top 12 by number of 2016 black-type stakes winners 4 years old and older. He stands for $6,500 this year. The 24-year-old son of Afleet—Nuryette, by Nureyev, has 16 crops of racing age. He is the 16th-leading sire in the Grayson-Jockey Club study by percentage of starters from foals of racing age with 81.2%. If only active North American sires are considered, he is the seventh-leading sire behind More Than Ready (1,253 foals, 86.8% starters), Petionville (736, 86.1%), Weigelia (75, 85.3%), Langfuhr (1,328, 85.1%), Street Sense (466, 84.1%), and Mass Media (199, 81.4%). By lifetime starts per starter, Northern Afleet is the third-leading active sire with 19.87 out of 1,328 foals of racing age. The top active sire in this category is Murmur Farm's Petionville, who has 21.26 starts per starter out of 736 foals. The 25-year-old son of Seeking the Gold stands for $5,000. Ranked second by starts per starter at 20.48 is Lane's End's Langfuhr, a 25-year-old son of Danzig, who stands this year for $5,000. Among all sires—active, pensioned, and dead—the leaders by starts per starter are Mutakddim, a son of Seeking the Gold, who has 23.91 starts/starter out of 797 foals; and, former Maryland stalwart Not For Love, a son of Mr. Prospector, who has 21.90 starts/starter out of 974 foals. Mutakddim died in 2014, while Not For Love died in 2016. Besides durability, Northern Afleet's runners have shown class as well. He is co-ranked in 12th by 2016 black-type stakes winners with five that were 4 years old and up and co-ranked in eighth place with three graded/group winners that were 4 or older. His graded/group winners last year include World Approval, winner of the United National Stakes (G1), Kaigun, winner of the Pan American Stakes (G2), and Baccelo, who won the Philip H. Iselin Stakes (G3).